A golden dragon was held aloft on poles by skaters. Kobe Bryant appeared on video. NHL mascots gave the crowd a primer on what this odd game is all about. 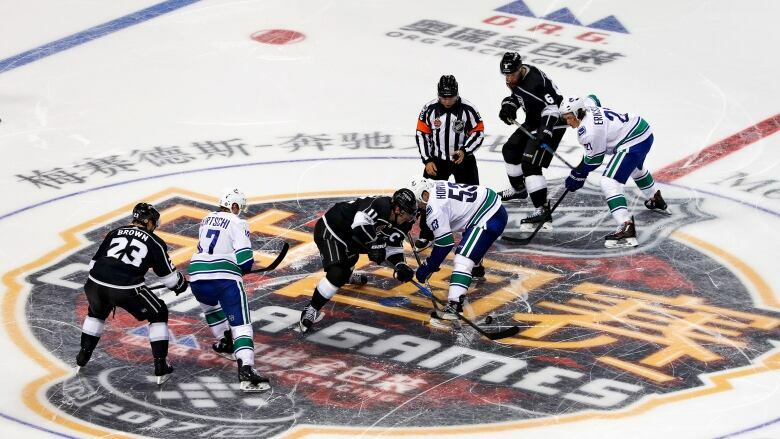 NHL preseason hockey made its debut in China — a 5-2 victory by the Los Angeles Kings over the Vancouver Canucks. A golden dragon was held aloft on poles by skaters. Kobe Bryant appeared on video. NHL mascots gave the crowd a primer on what this odd game is all about. NHL preseason hockey made its debut in China — a 5-2 victory by the Los Angeles Kings over the Vancouver Canucks — in a step by the league to crack an immense market. The fans in Shanghai got a fast and physical display Thursday — 17 power plays and 57 shots on goal, all met with loud cheers. Each hard check drew a collective "oooh" or "aaah." "Obviously, you wanted to put on a show for the fans here and they got to see some goals, too," said Vancouver forward Sven Baertschi, who scored the Canucks' first goal. An announcer came onto the ice to explain the finer points of the game as Fin (Vancouver's killer whale) and Bailey (Los Angeles' lion) acted out infractions such as charging, crosschecking, tripping and hooking. A golden Chinese dragon came out next, hoisted on poles by seven skaters. A group of Chinese kids in hockey uniforms joined the NHL players during China's national anthem. With Beijing to host the 2022 Winter Olympics, the NHL is showcasing two preseason games in a country unfamiliar with hockey. The Kings and Canucks play their second game in Beijing on Saturday. Even if the rules remain somewhat of a mystery, the crowd appreciated the speed and collisions. "To be honest, we didn't know what to expect. We didn't know the crowd, the noise, the atmosphere," Los Angeles coach John Stevens said. "I think the whole thing for me is we're here to grow the game. It's my hope that the more they see it, the more people like it." Tanner Pearson scored twice for the Kings and Alec Martinez and Jeff Carter each had a goal and an assist. Jonathan Quick made 31 saves. Team allegiances were hard to find in the crowd, the most demonstrative fans being rowdy Canadians waving their country's flag. Spectator Inge Zhang was more appropriately attired for an NBA game, wearing a Miami Heat jersey with pink letters. A media manager for the Shanghai Sharks basketball team, she was excited because she heard a certain NBA great might be there. "So we came here actually for Kobe Bryant," she said while her friend laughed. "But I love this sport, too." Bryant, in fact, did show, although in a video message to support his hometown Kings. "I see more foreigners here tonight than Chinese, but I think there are still a lot of hockey fans in China," Zhang added. "I think the NHL should take this opportunity to grow the sport here." That's the plan now that the NHL has signed a contract to bring two preseason games to China for six of the next eight years. "The effort here really is to build from the grassroots up, to try to grow the appreciation for the sport, the understanding of the sport," NHL deputy commissioner Bill Daly said before the game. "We've certainly made the Chinese Ice Hockey Federation and the Chinese government aware that we're willing to help any way we can as they gear up and prepare for the 2022 Beijing Olympic Games." But this is the first step in a long process. "It's great for China itself to see the NHL live and in person, see the speed of the game, how good the players are," Vancouver coach Travis Green said. "But whenever you're bringing hockey to a new country, it's going to take time. I think it's great the NHL is committed to doing that."